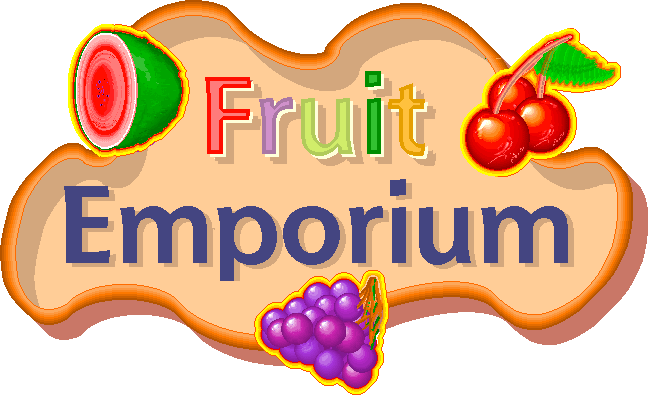 Skytopia : Fruit Emporium - taste sorted by 'weirdness' factor! How much is a pineapple worth? Is a strawberry really better than a cherry? What does that spikey fruit at the supermarket actually taste like - does it taste any good? Where does the humble apple fit into all this? Every fruit analysed and rated according to how weird they taste and how /good/ they taste. Additionally, the fruits have been given ratings indicating the degrees of 'sharpness' and 'sweetness'. Note: Ratings for taste are generally logarithmic, so a rating difference of about 6 points makes a real difference of double/half etc. I have tried to taste as many of the fruits as I could (and on more than a couple of occasions in case it was off). I have also tried to be as accurate as possible ;-) Since this page is updated, expect to see more fruits featured here in the future. If you have any comments regarding this page, please email me at the usual address. Any fruit which stands out in any way will receive an award! Main ratings will be given for taste and weirdness. Further seperate ratings will be given for sweet/bitter and sharp/flat. a: More ratings for each fruit including sharpness and sweetness ratings. b: New tables categorising each factor by order of rating (soon to be complete). c: Papaya, Cherimoya, Sharon fruit, Pomegranite and 4 types of grapefruit added. d: Information changed/added to many other fruits. e: Slight shuffle of fruit placements and a few bugs fixed too. Having said this, it is a better fruit to eat if peeled, so add a few points in that case. Just like the others, this is the most 'ideal' orange under judgement. Well, who can resist. Very citrusy, and much like a lemon, but not as bitter, thus better. The seedless variety of the grape is a must is you want to stay sane. If there had to be a default flavour for a 'tangy' fruit - the grape would be it. The purple variety is slightly preferable thanks to being a tad sweeter. Blissfully easy to peel compared to its cousin - the orange, this sweet fruit also tastes like one, but with a slightly less tangy flavour. There is barely any difference between the tangerine and satsuma. Both however are superior to the clementine. Similar to the tangerine/satsuma/mandarin, but worse basically. A watered down version, one could say it is slightly 'off' when put up against the tangerine. How a banana should taste, and not anything like the yellow/brown banana thank goodness. Everyone is used to what a banana tastes like, but it is fairly unusual in that there's not an ounce of citric-y-ness (cheers) to it - i.e. nothing like an apple/orange. Similar to an apple, the pear has a somewhat more subtle flavour. Easier to eat too, according to what time you eat it (an apple always stays rock hard). Effectively an overgrown cherry, the plum has a nice 'chunky' texture. Fairly big, tangy, sweet, easy to eat - what more could you want? Also similar in taste to a nectarine. Providing you can stand the rough/furry skin, they have a similar to taste to a 'standard' nectarine (but maybe don't quite match up to the to the deluxe nectarines). Arguably the best fruit ever, especially when freshly picked from the fields (oh - you're meant to store them for later?). Their only real drawback is the size which often is small-ish. Yes, apple-sized strawberries would be cool so this gets the award for the best fruit ever! Barely any different from a lemon unfortunately, so it's just as bitter. Lime cordial and (especially) lime jelly always smells so nice :/ Can't say the same for the fruit for some reason. There's an extremely unique flavour there - it's just dug deep. Very nice - a superior version of a plum, with their small size being their obvious drawback. erm..... they look shiny too. Did I mention that they looked shiny? Note: the dried version of a cherry (often put on top of cakes etc.) is nowhere near as nice and it fact tastes like something else altogether. A unique tasting fruit shaped similar to the blackberry. Did you know that the raspberry isn't technically one fruit - but many fruits - combining to form one compound fruit. Technically known as a 'syncarp' fruit. I've tried out 4 types of grapefruit now, and can say with some confidence that the best has to be the white grapefruit. This is the version that scores so highly. Yellow grapefruit This is the most 'boring' and 'typical' grapefruit. Quite good really, with obvious citrusy overtones, but it does leave an unpleasant bitter taste in the mouth afterwards. White grapefruit The best! Less like a grapefruit and more like a Pomelo (but with a sharper taste), this is definitely what a grapefruit should taste like. It should dominate the supermarket shelves! A real surprise this. It's hardly known and even comes into the 'exotic' category, but in taste, it combines a subtle orange, a bit of tangerine and a slight grapefruit flavour. It actually looks like a typical grapefruit, but only the white grapefruit is comparable in taste. Sweeter, and more refined, it should at least be as popular with the better varieties of grapefruit. Definitely one of the top citrus fruits - try one ASAP. Effectively an inferior version of the blackberry, this tiny blue-black fruit bears much in common with the red-currant... well at least as far as size goes. I've never actually tried one of these until now. Shape is a reminiscent of a peach. As for flavour... hmmmm... a bit of pear, plum and peach but not really as good as any of these. No actual unique taste as such. A semi-exotic fruit, the kiwi is awesome in its subtlety of flavour - and is superior in every way to the watermelon. A tangy, sweet pulp, with a dreamy texture, it goes without saying this fruit is highly recommended. Now all we need are watermelon-sized Kiwi fruits! The heavy weight of the fruit world. Hmm.... a fairly tasteless fruit, but not bad nonetheless. It has a slightly salty flavour and I suppose one could say it has a taste in between a cucumber and a pear, with the texture of the latter. Very big - that's for sure. A 'sharp' version of a grape, with the best variety tasting sweeter than the 'average' gooseberry. Watch out for the weird half-edible spikey-esque skin though. 'Paw' by name - poor by nature. It is in fact even more boring than a watermelon if that's possible. Suffering from the same problems that plague other fruit, it basically... tastes a bit like a vegetable. I can't quite pin it down, but maybe something like cucumber or tomato. Tasting quite nice in a way, this fruit has elements of apricot and peach. Unfortunately, it also suffers a problem quite common among the less popular fruits in that it has a slight vegetable flavour. The culprit in question is the Parsnip. ...looking like a strange kind of onion (or plant bulb for that matter), this weird fruit could be said to have the taste of a slightly salty watermelon or a 'subtle' version of a pear. Nothing spesh. If there had to be a fruit that tasted like a cross between a typical citrus fruit and a poisonous plant - then this would be it. Not really meant to be eaten in its own right, it's usually used for contrast in puddings etc., but as this article rates each fruit stand-alone, then this will score fairly low. Cherries look the same, but are much bigger and tastier; eat those instead. The most popular 'exotic' fruit, this fruit tastes as good as it looks. An unusual fruit in the sense that no other fruit quite has its taste. This small fruit contains an extra added unique flavour on top of an ordinary grape. The sweeter, preferable variety has a deeper red shell. Apparently, there's a more preferable version of the lychee - recognised by the fact that there's no surplus fluid once the shell is broken. I've yet to try this kind. A pear shaped fruit, but with a green mottled or leaf surface which upon opening reveals an avocado-esque white-ish centre. After the horrors with /that/ particular fruit, I hoped for something a bit better. Hmmm... well it turned out to be quite strange, and not as bad as the avocado, but still mediocre. Taste combines a hint of avocado, with a touch of overripe banana and a pinch of pear. Hmmm indeed. A tomato shaped fruit except it has a yellowy golden colour to it. Taste is ummm.... sorta subtle peach taste, and quite a bit of the bland 'cucumber' taste, but saltier. Something like that. Interrestingly though, I've been informed that the one I had was not as nice as they usually are. I'll retaste one in the future for a possible higher placed ranking. Oooh, this is a close call to the Rambutan. Its shape is that of a lemon, but longer, and with a cheesy looking skin. Similar to the 'Paw Paw' in that the taste is virtually non-existant. Well, actually there is a very slight 'interesting' flavour there, but it's just dug /so/ very deep. Also, what you don't want to do is accidentally bite into the pips inside. They taste like stinging nettles and if you should bite sufficiently hard enough into one of these pips, they also sting a bit too on your tongue - cool I know. A strange, creamy fruit. In fact it almost tastes like nothing. Except it doesn't quite taste like nothing. There's a 'subtle' eggy/creamy/nutty flavour. This isn't necessarily always a bad thing, but for a 'fruit', it's probably not advised. Anyway, if not for the taste, you might want to try it for its novelty. Just don't expect to enjoy it much. Woah this does bring back memories. It is an understatement to say this is awkward to eat. The rankings for all the fruit listed on this page do /not/ take into account ease of eating (or peeling) which is why the Pomegranite scores so highly, but it would certainly score lower if this factor was taken into account. You open the thing up and there's an inedible 'pulp skeleton' with loads of small seeds roughly on the inside. So where's the fruit you may ask? Well, believe it or not, the fruit is contained in a very small 'bag' around each seed. So all you have to do is take out each seed and painfully bite around each one. It's a bit like eating hundreds of tiny plums! Taste is a cross between redcurrant, cherry and orange. If microsoft ever designed a fruit, the Pomegranite would surely be it. Now first glance at this, and you'd be forgiven for thinking it was a badly bruised apple. Also, on opening, the contents look quite revolting! But the proof of the pudding is in the eating as they say, and so I decided to risk biting into this number (I don't know, the things I do for you lot). Hmm.... not bad actually - kinda sickly sweet, but a very unique flavour. Lots of pips - that's for sure. Woah, this does look weird - like a lychee that's suddenly decided to de-evolve and grow hair. Apparently, it's meant to taste like a lychee too, so let's put the two to the test. Hmm... right, ugh, yes, it /does/ taste like a lychee and even looks like one, but there's an extra element which gives it a 'fishy' flavour. Definitely low on the scale. Stick to the lychee. Visit Skytopia's Whirlpool of Knowledge Forum. All feedback appreciated!